Many friends and relatives gathered in St. Alexander's Church of Vila Park last Friday morning for the last tribute to Edmund F. Wolff of 202 South Third avenue who passed away on Tuesday, November 12, at Elmhurst hospital from infection resulting from a [r]uptured appendix. Requiem mass was celebrated by the Rev Father Kennedy, burial taking place in the family plot in St. Michael's cemetery at Wheaton. 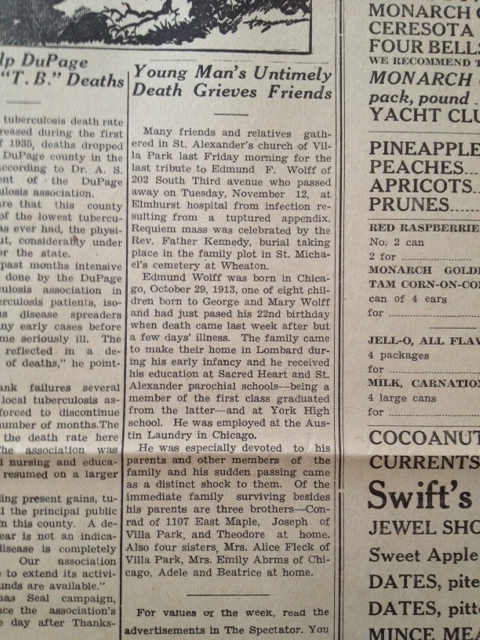 Edmond Wolff was born in Chicago, October 29, 1913, one of eight children born to George and Mary Wolff and had just passed his 22nd birthday when death came last week after but a few days illness. The family came to make their home in Lombard during his early infancy and he received his education at Sacred Heart and St. Alexander parochial schools- being a member of the first class graduated from the latter - and at York High school. He was employed at the Austin Laundry in Chicago. He was especially devoted to his parents and other members of the family and his sudden passing came as a distinct shock to them. Of the immediate family surviving besides his parents are three brothers - Conrad of 1107 East Maple. Joseph of Villa Park, and Theodore at home. Also four sisters, Mrs. Alice Fleck of Villa Park, Mrs. Emily Abrms of Chicago, Adele and Beatrice at home. Are you a novice like me and wondering how I got this? Between Find a Grave and Illinois Death and Birth Indexes I was able to get his birth and death date. Death dates often didn't match across sources. Then I found that a wonderful soul had, at one time, made an index of all the deaths reported in the Lombard Spectator. That paper had been bought and bought and I tracked the current owners down on Facebook.They reported that their very own archives didn't go back this far and to try a historical society or library. I pursued two tracks- I got an out-of-state library card to the Helen Plum Memorial Library and I contacted the Lombard Historical Society. While the Helen Plum Library didn't have online access to the Lombard Spectator, they did offer a span of years of the Chicago Tribune that I didn't previously have access to. It was an incredible boon! Meanwhile, the gracious archivist and I corresponded and she found this in the trays and snapped a photo for me. She actually recovered two obituaries- but I 'll save that one for another post.